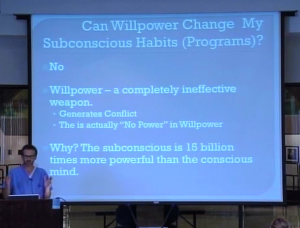 Can Willpower Change My Subconscious Habits (Programs)? Let’s get started! Click image to sign up now. The problem is that anytime you try to change a habit, you realize how hard it is to change the habit. Whether that’s – if you’ve ever broken any habit – biting your fingernails, smoking, you say “I’m done smoking, I’m done biting my fingernails, I’m done cracking my knuckles.” Whatever, any kind of habit you’ve tried to change, as soon as you attempt to do it, you realize how hard it is. And the reason that it’s so hard is that your conscious mind is about 15 billion times smaller than your subconscious. So the part of your brain that you use as your conscious mind is this big, and the subconscious is as big as this room. And your conscious mind decides, “I’m done biting my fingernails.” So your conscious mind tries to strong-arm or arm wrestle this enormous subconscious, this enormous subconscious supercomputer that’s running programs. And willpower doesn’t work because the conscious mind is too small – number one. And number two, it generates conflict, which makes you miserable. Because you have programs, and the programs run and run and run, and while those programs are running you consciously can say, “Look, I’m done biting my fingernails.” But that conflict makes you uncomfortable. And when you’re uncomfortable, it makes you want to resolve the conflict and you resolve the conflict by going back to whatever your previous habits where. Click here to for instant online video access. 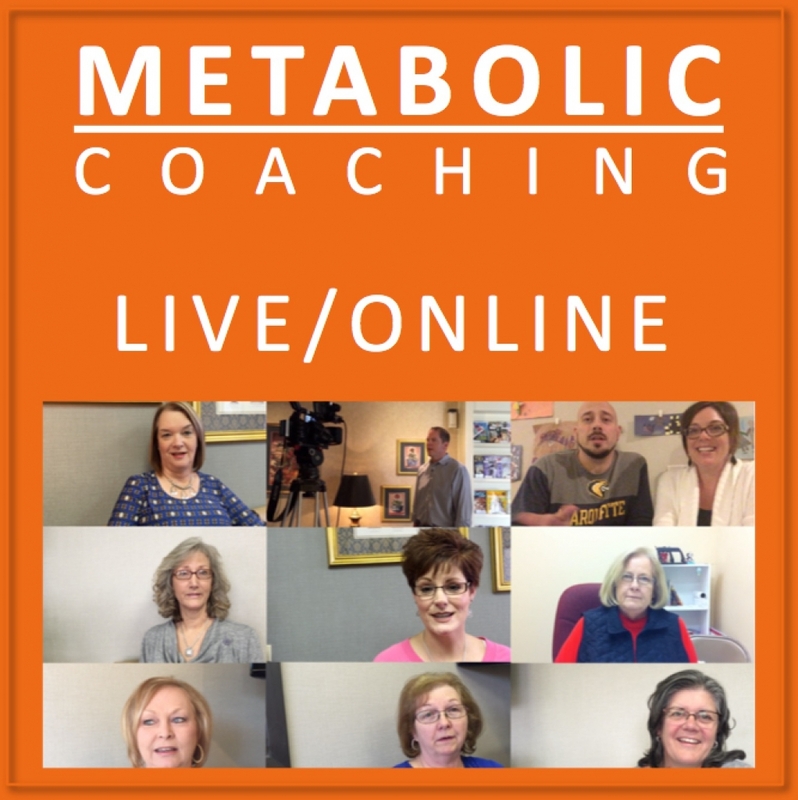 Or learn more about the complete online seminar, audiobook, meditations, written instructions, and more. I’ll say one other thing. When you develop any sort of habit, your mind actually develops new – your brain, your actual brain – develops new neural pathways. The parts of the brain that you use over and over and over, those parts of your brain get stronger, they actually grow in size. So it’s not just that you have a habit and it’s something you think about. It’s like there’s a part of your brain that is dedicated to doing that habit. And that’s why smokers, when they start smoking, it’s actually difficult. They have to learn to start smoking, it’s hard to inhale smoke into your body and hold it in without coughing and you light a cigarette, how do you hold it? You don’t wanna burn yourself. It’s hard to learn to start smoking, but eventually, second nature — you reach for a cigarette, you don’t even realize you’re doing it. That’s when you have the program installed. So how do you de-install one of these programs? Number one, I’ve provided everybody here with a meditation CD. 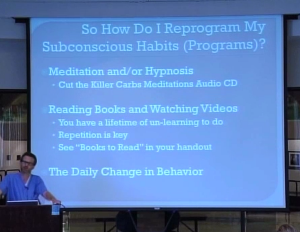 And the meditation CD is a CD that’s designed to uninstall the eating carbs program and re-install the cut the killer carbs program, it reinforces everything we’ve talked about today. Both hypnosis and meditation, those are ways that you turn off your conscious mind, you bypass the conscious mind, and instead of trying to convince yourself of something consciously, you just relax and you just listen. And you just let the words of the meditation kind of drift over you. And it’s a direct route into your subconscious mind, bypassing the conscious. So when your conscious mind is fighting with your subconscious, there’s conflict. But when you just turn off the conscious mind and just listen to the meditation, there’s no conflict. So there’s no willpower. There’s no willpower involved in this method. And I’ll tell you about that CD, that CD you can put it on an mp3 player, put it on your iPhone, your smartphone, you can put it inside a CD player in your house, don’t listen to it when you’re driving. Because it’s mediation, and you don’t wanna relax yourself and run into a telephone pole. It’s made to listen to right before you go to bed at night, right before you go to sleep at night, so you’ll think about that during the course of the night so it will impress itself into your subconscious mind. And that CD has four meditations. You should listen to Meditation 1 every night for the first 3 weeks, Meditation 2 every night for the next three weeks, Meditation 3 every night for the next three weeks, and Meditation 4 every night for the next three weeks — that’s 3 months. The reason I find hypnosis and meditation so helpful for me is that I have trouble sleeping at night. And I listen to one of these things and I go right to sleep. If you fall asleep easily, like my wife – she goes to sleep within 30 seconds of hitting the bed – if you fall asleep easily, you need to at least stay awake and conscious through the verbal part. You need to stay awake through the verbal part so you may choose to do it sitting up in a chair, listen to it sitting up in a chair before you go to bed. The other thing you can do is you can reprogram your subconscious by simply working through the conscious mind to learn new things. And that’s why I gave you the list of books and the list of movies. The meditation CD, it bypasses the conscious mind, it bypasses your thinking mind. But reading books and watching movies, those are conscious things that you can do. Because if you read the Atkins diet books and he says, “Oh your cholesterol gets better, you lose weight, this is great.” And then you read a Slim Now, Slim Forever, that’s another book on the list, and then you read Good Calories, Bad Calories, and then you read Wheat Belly. After you read it over and over and over, you realize, “Oh, maybe this is really what I should do. Maybe this really does make sense” to your conscious mind. And the third thing is the daily change in behavior. Because I can tell you, every time you pass up the killer carbs and you eat something different, something that’s healthy for you, something that actually gives you energy and makes you feel better, every time you do that, you start creating those new neural pathways, those new parts in your brain that are going to make your new low-carb lifestyle easy. For instance, was eating a hamburger without the bun normal for me? No. Was eating a head of lettuce almost every meal normal for me? No. Was eating eggs every morning or breakfast normal for me? No. But it is now. After two years, it is now. In fact I can think back when I wask a kid. When I was a kid, my three favorite foods were mashed potatoes, baked potato, and french fries – that’s potatoes, potatoes, and potatoes, carbs, carbs, and carbs. And that was a program, I installed the potato-eating program. And 37 other outstanding and knowledgeable contributors! 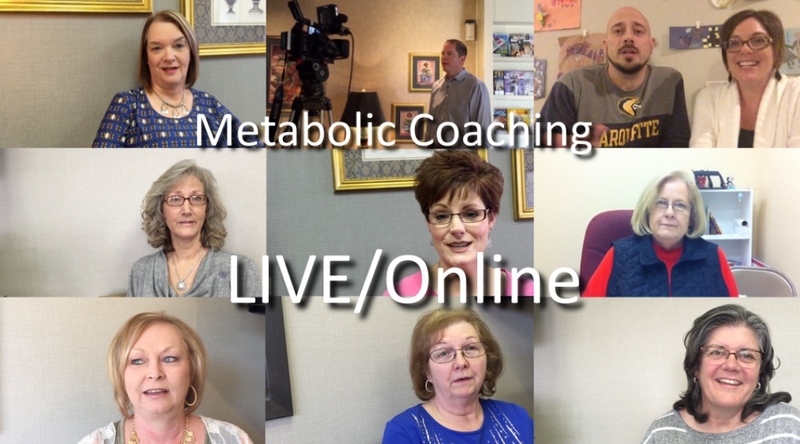 ... A Low Carbohydrate Diet!